Smaller than many cellphones, this potent powerhouse provides 24 full months of complete protection from Carbon Monoxide (CO) exposure without missing a beat! It detects CO in the range of 1 to 999 PPM with 1 PPM resolution. 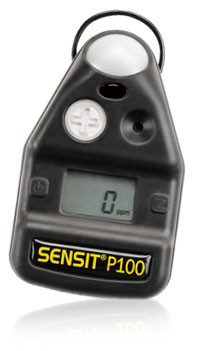 The extremely durable Sensit P100 (CO) provides audible, visual and vibration alarms when any of the preset limits are exceeded. The preset operational life at 24 months provides an easy reminder to have the sensor and battery serviced. The Sensit P100 (CO)has two basic styles of instantaneous alarm: Low Alarm (50 PPM) activates at two second intervals while High Alarm (200 PPM) activates at one second intervals. Since Carbon Monoxide is a cumulative poison that builds up in the body over time, the Sensit P100(CO) also tracks a time weighed average (TWA) over 8 hours and will alarm when the TWA is greater than 50 PPM. In addition, as Carbon Monoxide can cause more immediate harm at higher levels, the Short Term Exposure Limit (STEL) alarm is set at 75 PPM. The custom display provides the user with easy to view information including gas concentration, time remaining in months to sensor replacement, battery low alert and activation of calibration process. The Sensit P100 (CO) is constructed of durable high impact ABS plastic. The top housing is additionally protected with a shock absorbing material to protect the instrument from the rigors of field use. The front of the instrument has an opening for the sensor and sounder. These are sealed to maintain the integrity of the IP65 rating. Two buttons operate the instrument. The left button is for power while the right is for zeroing and performing calibration. Multiple LEDs beneath the frosted area create a very bright warning even in bright sunlight. The instrument is mounted using a sturdy suspender clip on the back of the instrument. This instrument cannot be powered off or zeroed when in alarm mode. The sensors and battery are designed for 2 years of continuous normal use. The on-board memory will store up to 100 events or alarm conditions. These can be downloaded through a specialized connection and a computer interface. Oldest events are over-written automatically when the maximum is reached. Q: After 2 years do you have to purchase a new unit or replace the CO sensor? A: The sensor can be replaced for a factory service charge. Or the unit may be replaced at your option. 219 TruReward$ points will be placed in your account when you buy this item.